Wearing a thermal in May. That’s Boston for you. It’s May 13th and there’s just enough of a chill in the Boston air for me to wear my new thermal shirt. I purchased this recently for an upcoming trip to Iceland and love how soft and swingy it is. 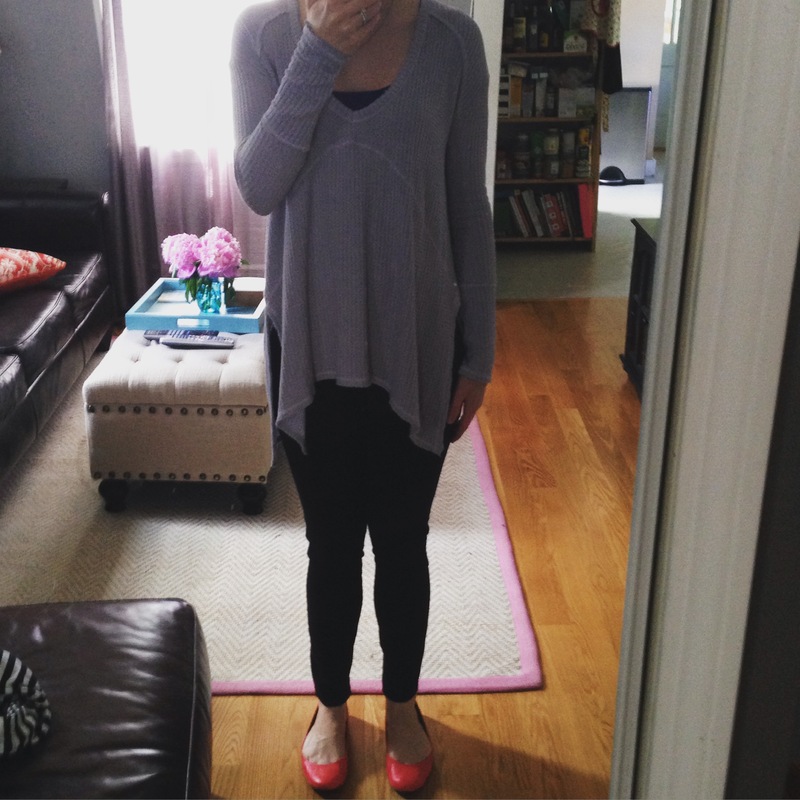 It drapes nicely to pair with leggings or skinny jeans and can easily hide a food baby if you’d like. It’s the perfect shirt to wear when I’ll probably be doing a lot of eating and drinking on vacation soon. My thermal Shirt is from Free People. I got it here at Nordstorm in Light Periwinkle. This color really is very flattering for pale people. It’s a greyish/purple/blue that I love. It would probably look good on a tan person too, but just pointing out that it’s especially flattering for those of you with cool skin tones with a red undertone like me. I chose to wear a purple tank top underneath because this thermal is low cut and I wouldn’t want to wear something low cut to the office. Similar tanks are available here, here, and here. Gold Love necklace available here. Pixie pants in Navy Blue available here. These pants only look good with a dress/tunic over them. I do not think you can escape that fact unless you have some serious thigh gap going for you. Red ballet flats available here. 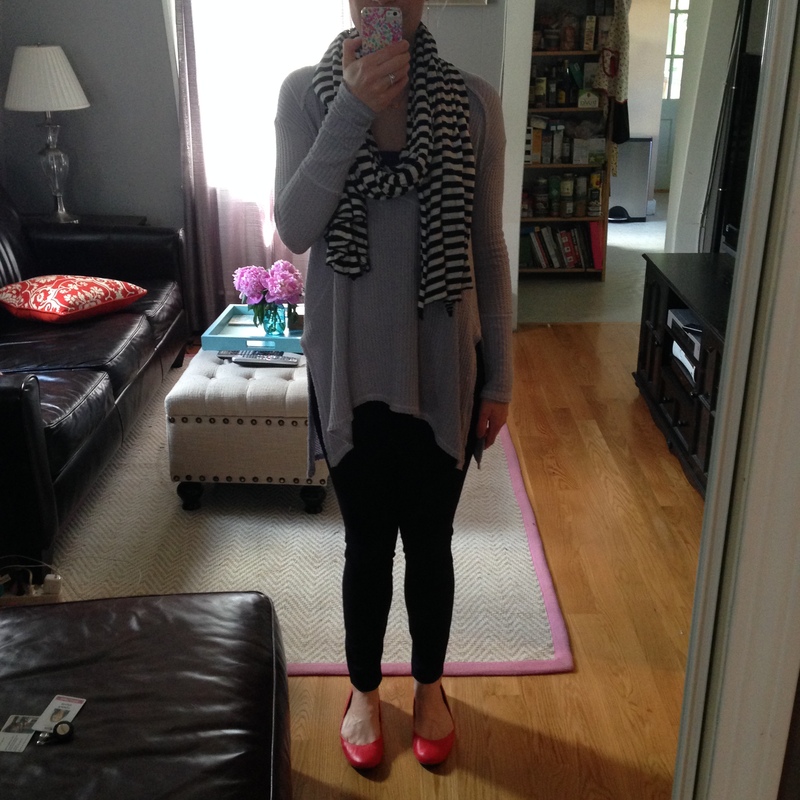 My cotton striped scarf that I’m wearing in the picture below is from Petit Bateau. I have to admit that I bought this scarf a few years ago when I saw Aria Montgomery wear it on ABC Family’s TV show Pretty Little Liars. I pretty much just watch that show for the fashion, hair and makeup. It’s so inspiring! Mandi Line is a costume wardrobe genius and a complete inspiration to the fashion world. Happy half way through the work week day! Spring time in Boston. Instagram outfit roundup. Say my name, Say my name. Name plate necklace with gingham.